A Canadian fell to his death from about 12 metres (39 feet) while ziplining at a popular tourist attraction in northern Thailand, police said Tuesday. 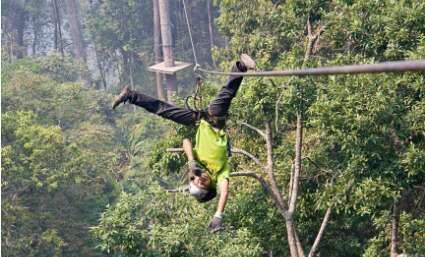 He “fell to his death from the zipline… on Saturday,” said police major Sakarin Wiratsaken of Chiang Mai’s Mae On district, adding that the Canadian was travelling with his wife. The incident happened halfway through the victim’s zipline journey when “the lock on his body harness and the main line broke”, plunging the Canadian from the height of 12 metres. The accident highlighted lax safety rules in the tourism sector, and authorities have been scrambling to remake the country’s image since.